Ibu Evi, coordinator of the Pondok Dua nursery facility and caregiver for many of the young orangutans at the OFI Care Center, is an exceptional photographer of some of the smaller, mesmerizing creatures she comes into contact with during daily releases of the orangutans under her care. Continuing her stunning photo series, we would like to share images from a taxonomic order that has the tendency to cause many people to shudder at the thought of them and jump at the sight. Those with arachnophobia might want to steer clear of these beautifully detailed photographs! 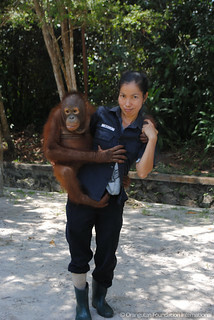 Howard clings to OFI caregiver, Ibu Evi. Though the fear of eight legged creatures persists among us, spiders have inspired scientific research, are a common symbol in art and mythology, and have come to symbolize balance, patience, and creative powers in cultures across the globe. 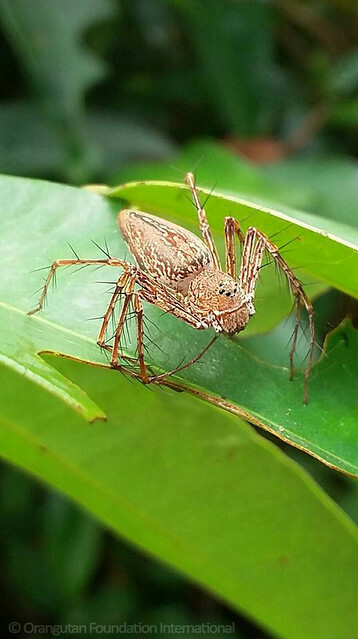 Spider evolution began with crab-like ancestors who emerged from the sea, forming the foundation for the wide variety of spiders in the world today. 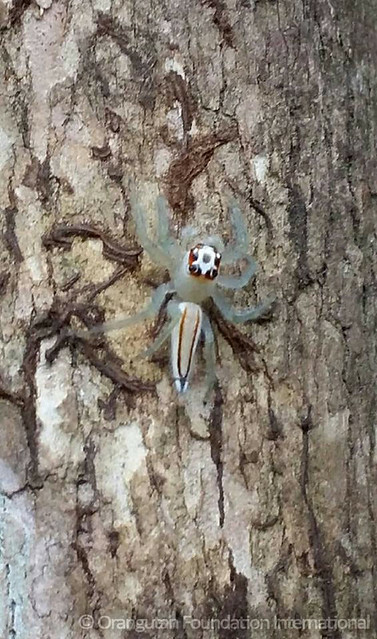 Ranking seventh in total species diversity among all other orders of organisms, spiders display an impressive variety of colors and appearances. Other than the herbivorous species Bagheera kiplingi, spiders are recognised as predators, preying on other organisms such as insects, other spiders, and even birds and lizards in the case of some larger species. The techniques spiders use to seize prey are almost as diverse as their appearance. In addition to the commonly known sticky webs, spiders can mimic and chase prey and even lasso prey with ‘bolas’, sticky yo-yo blobs of silk. The silk created by spiders is superior to any synthetic alternative. It is lighter, stronger, and has more elasticity than any human made fabric. While their appearance and hunting strategies might make you tremble, spiders include only a few species dangerous to humans. Most spiders are venomous but some have mouths that cannot easily bite humans. 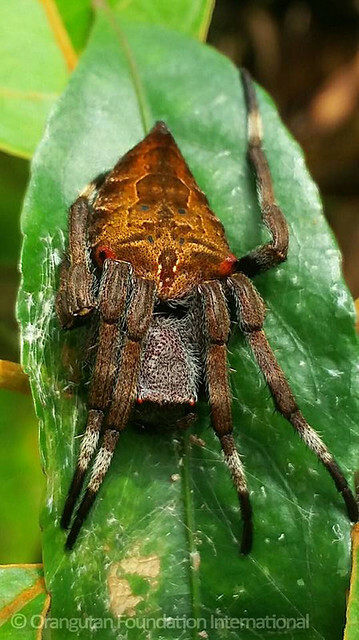 Scientists are even developing methods to include spider venom in both medicine as well as biological pesticides to substitute the current harmful chemicals used on crops. 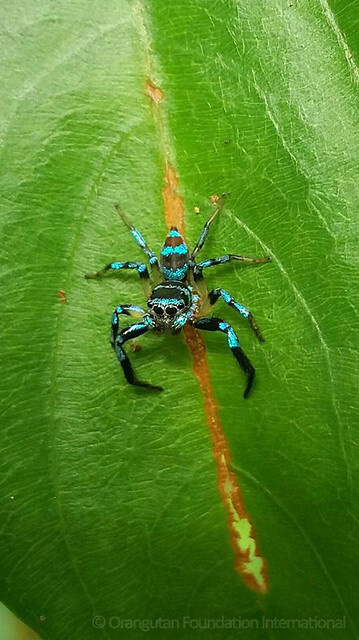 Just as an aside: OFI’s president, Dr. Biruté Mary Galdikas, may soon have a spider named after her. 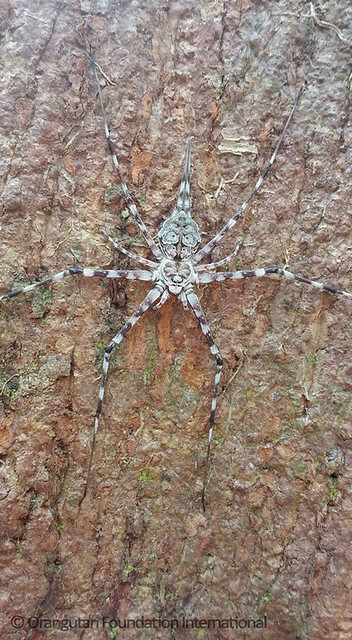 She found the dead “bird-eating” spider in her village home and sent it to a spider specialist who declared that it was a new species! Did you enjoy this photo series? Share it with your friends! Wonderful photos Ibu Evi – thank you. Ibu Evi’s photographs are amazing. 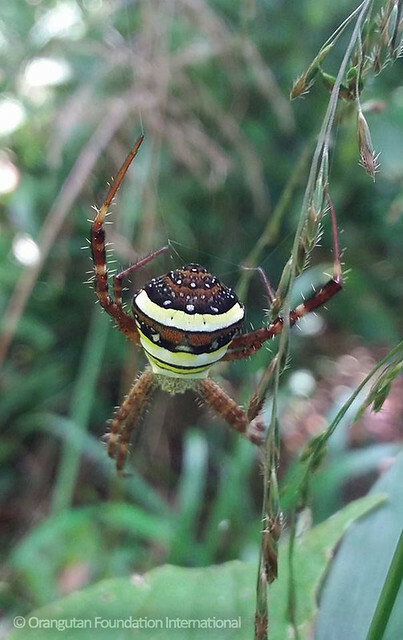 Some of these spiders are very pretty. Thank you for sharing this story. Beautiful pictures. It reminds us of how amazing nature is in its complexity. Spiders play an important part in the food web (pun intended).